Written with my usual unusual sense of humor, this book is not dry like most teaching texts. With a minimum of technobabble and about 170 full color graphics, interspersed with unexpected punch lines, you will find learning really can be fun and easy. Don't let the humorous aspect fool you though, this is a serious teaching text used in colleges across the United States and other English speaking countries. The first edition was very popular, needing 3 separate printings to keep up with demand. The second edition went into extra printings also. The new 3rd edition, which is a complete rewrite, is expected to be the most popular book of all! Learn HTML, XHTML, and CSS from the one guy that makes learning web design easy AND fun! Hi Mr. B! I'm an artist who has just done a website with my photographer husband and what an experience it was...is!! Took a class at Junior College to aquaint ourselves with the "new world" and the instructor recommended your book. It is wonderful, and as the instructor said . . . with this book you don't really even need me. He was right and we are so glad we found you! See the Full Table of Contents to see what a complete book this really is! As you can see, in addition to the teaching chapters there is an extremely thorough set of reference charts that total 86 pages. What's more, the book is spiral bound so it lays flat on any page - this is extremely handy! It's everything you want in one handy place, and written in a style that is user friendly and fun, and of course, easy to understand. Easy to Use? You Bet! "I just read what I believe to be the best book on web design ever written. It was written by Dennis Gaskill (also know as Boogie Jack.) 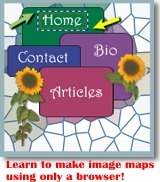 It is so easy, so much fun..."
There are lots of full color examples throughout the book, as shown in the graphic on the right that is part of the tutorial on making image maps. 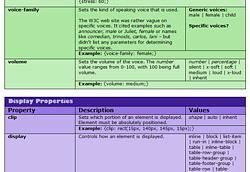 Colored graphics and code samples help make learning easier. Besides that, color is just more interesting! Why be bored just because you're learning? "It is beautifully designed with great graphics and color schemes. I have read so many books that are all hype and offer no practical information, this is the exact opposite." Packed with practical step-by-step instructions and handy color-coded reference charts as shown on the left, you simply can't go wrong. It's used as the teaching text in hundreds of high schools, tech schools, independent colleges and university systems here and abroad . . . as far away as Africa. Why would so many instructors choose this book? Quite simply, the clarity and casual writing style makes their job easier—plus, the sprinkling of humor just makes learning more fun. Wow, that was easy. I can't believe I get paid to write this stuff. Anyway, with above style rule, any time we create a <div> element on our page there will be seven pixels of padding between the content within the division and the outer edges of the division. In Figure 6.2 you can see what adding just one pixel of letter spacing does to the text. The font family and size used is the same in both paragraphs. The following ideas [for web site traffic generation] were intentionally focused on low-cost and free ideas to attract visitors to your web site. Most people reading this will be just starting out and probably working on a very limited budget. It was assumed anyone with money to burn on promotion would not be reading a do-it-yourself book. If you do have money to burn, you might want to consider hiring professional marketing services. I've rated each method of promotion on a scale of 1 to 5 stars, with 3 stars being the best. Um ... just kidding, a 5-star rating is the best and a 1-star rating is the least effective, but that doesn't mean you should ignore it. On the other hand, don't think any of these traffic attracting methods means an instant influx of steady traffic. A continual stream of daily traffic is built a little at a time, but some methods do provide surges of traffic that can last from a day to several days. Spiral bound to lay flat! I just had to stop what I was doing and let you know what I thought about your book. I just received it yesterday and I haven't put it down. I have spent hundreds of dollars on books, editors, etc. but just couldn't figure it all out. Seems like the little steps were left out. They always assumed that you knew what to do in between the steps they left out. I . . . was very impressed. I especially like the case problems and quizzes at the end of each chapter. Dennis has the ability to present material in a very logical and coherent manner. He makes what could be a very dry subject fun to teach, and I would expect, fun to learn! I teach web design and until now have been relying on material that I wrote to teach HTML coding. 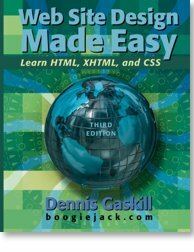 This is the first book on HTML code that I have found that actually covers the code in a logical, progressive manner. 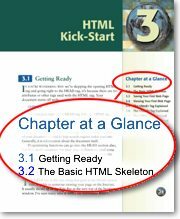 Most books give you "fill-in-the-blanks" projects rather than teaching how to "build" a web page using HTML code. This book presents the material in an easy to follow, well-exampled format. The fact that it is spiral bound is also a plus in useability as well as workability. I don't have to guess when I follow his clear and easy to follow instructions. Dennis writes in a friendly, approachable style. He offers down-to-earth practical advice on creating a quality, solid web site. I like the nifty references in the back. He has a trouble-shooting section in the appendix that is excellent. For example, he tells how to fix that annoying blue tick that can occur after a link. The solution is simple but the blue tick drove me wild for months until I found out how to fix it. The spiral bound design is excellent, too. It is wonderful to not have to prop the book open and weight it down with heavy objects so the pages will stay open while I'm trying some of the techniques. Folks, buy this book. It's a keeper. I hope Dennis Gaskill writes more. Dennis Gaskill's book is fanstastic! I've read about a dozen books on web design and HTML, but always got bogged down in the details, or felt things seemed too hard to grasp. Dennis definitely has a gift for imparting technical information in a way that is both clear and interesting to read. This is the best web design book I have found. It explains everything in simple terms. Everybody at Harrisburg Area Community College wants this book. A seasoned web pro in every respect. No one writes with the clarity, humor, and humanity of Dennis Gaskill. He can show you how to easily build a nifty web site - or how much a simple kindness means to the new kid on the block. When it comes to web design, integrity, and life on the web, one name stands out above the rest - Boogie Jack! Whatever he writes is a must-read!